Photo courtesy of Ned Denison with Martin Cullen on November 18th 2006. My friend and mentor Martin Cullen passed away this week. What a terrible loss. I placed one phone call in 2004 looking to book a place on Martin's 8-mile sea swim...and it led to twelve great years of marathon swimming and contributing to the sport. Ireland had a successful and proud marathon past when Martin took the baton of leadership. He kick started much of the marathon craze that we enjoy today in Ireland. I like to think that he passed that baton to me a few years ago - and that he enjoy seeing it continue to grow. The Munster swimmers in the Irish Long Distance Swimming Association would like to pay special tribute to Martin Cullen at this ILDSA 40th Anniversary Dinner. In the last few years, there has been a huge growth in the interest and participation of open water swimming generally in Ireland and especially in Munster. We believe that Martin is one of the individuals who contributed directly to our recent growth. He encouraged inclusion and hence opened the sport, managed two annual key events and put an unbelievable number of people in the English Channel which garnered more positive press than the rest of Irish swimming combined. Encouraged inclusion and hence opened the sport: Martin welcomed swimmers from outside the strict confines of Swim Ireland clubs including those in wetsuits. We took his lead and participation in Munster swims has increased by a factor of 5. These new swimmers are also the most fun to watch as they set new personal distance records and draw large groups of cheering family and friends. Managed two annual key events: Inisbofin and Killary are Martin’s creation and annual burden. He secured insurance from charities, recruited swimmers, secured safety boats and hosted fantastic proper after-swim dinners. In Munster, we saved the 2005 Lee Swim at the last minute by taking his lead and securing insurance from the Lions Club. 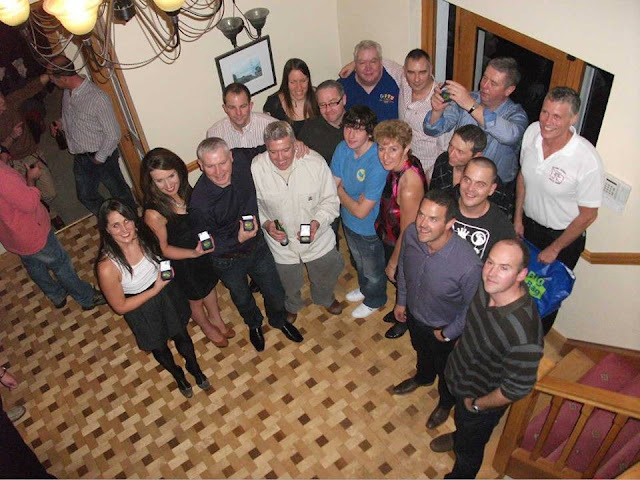 Martin then touched and motivated a new group of Munster open water organisers who have given the original team of Joe Donnelly, Steven Black and Terry Fleming some relief. This has led to an explosion of new events. We had over 200 local open water swims on our schedule in 2006 up from about 5 in 2002. Put an unbelievable number of people in the English Channel: Martin organised 18 swimmers from Ireland in 3 over-and-back relays in 2004. These included two previous Channel soloists and two who would use the relay as a springboard to 2006 solo success. Martin inspired another 30 relayers in 2005 and along the way inspired three Cork Channel soloists. 2006 was the year of the Irish in the English Channel: 30 relayers and 6 soloists. All but one of the soloists was a direct result of a Martin Cullen action. In addition to organising, Martin swam in the relays both years. The follow on in 2006 was another Cork English Channel soloer and a 3-person one-way relay – the manager having learned as a swimmer on the 2005 relay! The follow on in 2007 is a confirmed solo aspirant and a 4 person relay – deposit sent and soon an under-age relay. Garnered more positive press than the rest of Irish swimming COMBINED: Look back at the past few years of press coverage of Irish Swimming. The negative coaching scandal and CEO controversy dominated the news until the English Channel swimming caught the public’s imagination. This had lead to major TV, radio, newspaper and magazine coverage – again mostly around the group that Martin touched and motivated. And believe me - the Spike Island swim and Alcatraz trip were the direct result of the buzz caused by the 2005 channel excitement. Martin was the leader, teacher and motivator. I speak for all those in Munster who you touched personally and those new open water swimmers who enjoy the results of your contribution. You gave our sport a positive push when it needed it most and you leave in Munster better long distance swimmers, new events, a receptive press and perhaps most importantly a new group of organisers with new energy. I am proud to be one of these better long distance swimmers and new organisers. Another eulogy by Fergal Somerville about Martin Cullen is here. It begins, "So sad to hear today of the passing of a giant of Open Water Swimming. Martin Cullen was a friend, mentor, trainer, confidant and a bit of a rogue. He took swimmers under his wing and helped them to reach their dreams. I am one of those swimmers and I owe so much of what I have achieved in the sport to Martin. His impact on the sport has been immense. He organised, he assisted, he developed, he encouraged, he commiserated and then pushed you on to try harder..."
Very sad news.....I met Martin a few years ago while I was in Ireland to swim the North Channel. His love of the open water swim community was incredible. His words were heartfelt and encouraging. He was a great man. He will be greatly missed.